Italy: Benito Mussolini establishes his Fasci di Combattiment (Fighting Fascists) organization in Milan. Germany: The Reichstag passes the Removing the Distress of People and Reich (Enabling Act), allowing Hitler to assume dictatorial power and eliminate other parties such as the pro-Catholic Zentrum. CBI - China: Day 82 of 142 of the 1st Battle of Hebei. USA: President Franklin Roosevelt approves the Constitution of the Republic of the Philippines. Spain: Day 250 of 985 of the Spanish Civil War. Spain: Day 615 of 985 of the Spanish Civil War. CBI - China: Day 260 of 2,987 of the 2nd Sino-Japanese War. Day 45 of 124 of the Battle of Henan. Japanese troops wipe out the Chinese outposts north of Tai'erzhuang, Jiangsu Province. Meanwhile, the Chinese 27th Division arrives to strengthen the right flank. Germany: Joachim von Ribbentrop and Vojtech Tuka sign the official document in Berlin declaring Slovakia as an independent nation under German protection. Eastern Front: German troops occupy the city of Memel (Klaipeda), Lithuania, situated on the border of East Prussia and Lithuania. Poland warns Germany that any similar attempt to seize Danzig will mean war. Eastern Front: Day 1 of 13 of the Slovak-Hungarian War, aka the Little War. Hungary invades Slovakia to gain additional land. Hitler fails to keep his protection pact with the Slovaks. Spain: Day 980 of 985 of the Spanish Civil War. CBI - China: Day 625 of 2,987 of the 2nd Sino-Japanese War. Day 7 of 54 of the Battle of Nanchang. Japanese river gunboats bombard the Chinese positions near Nanchang, Jiangxi Province. The bombardment will continue for three more days. Atlantic: A British submarine intercepts German merchant ship EDMUND HUGO STINNES IV 6 miles off of the western coast of Denmark. The ship is scuttled by its crew, then sunk by the sub. UK: IRA prisoners at Dartmoor, England, stage a riot. ETO - Netherlands: Dutch fighters accidentally shoot down an RAF bomber near Rotterdam. Germany: Deportation of Jews in German-occupied eastern Europe continues despite Goering's order for a temporary pause. PTO - Dutch East Indies: The British Malaya Force is formed to observe German merchant ships in Dutch East Indies. CBI - China: Day 991 of 2,987 of the 2nd Sino-Japanese War. Day 130 of 381 of the Battle of South Guangxi. Day 56 of 67 of the Battle of Wuyuan. Atlantic: German sub U-110 attempts to sink Norwegian ship SIREMALM southwest of Iceland. Attacking with her deck gun, a crewman forgets to remove the water plug causing the gun to explode. Atlantic: British anti-submarine trawler HMT VISENDA sinks German sub U-551 in the North Atlantic, killing the entire crew of 45. Atlantic: German sub U-97 sinks British tanker CHAMA 600 miles west of Land's End, England, killing the entire crew of 59. ETO - UK: Day 199 of 258 of the Blitz. MTO - Yugoslavia: Anti-Axis demonstrations are held throughout Yugoslavia. MTO - Italy: The Greek sub TRITON attacks an Italian convoy 20 miles east of Brindisi. The transport CARNIA is damaged. Although she is towed to Brindisi for repairs, she ultimately will be lost. MTO - Libya: Australian troops capture Giarabub in southeastern Libya. The Italian commander is captured and will spend the rest of the war as a POW in India. Erwin Rommel leaves Germany for Libya. East Africa: Day 287 of 537 of Italy's East African campaign in the lands south of Egypt. East Africa - Eritrea: Day 47 of 56 of the Battle of Keren. CBI - China: Day 1,356 of 2,987 of the 2nd Sino-Japanese War. Day 10 of 27 of the Battle of Shanggao. CBI - Thailand: Day 174 of 221 of the Franco-Thai War (Vichy France vs Thailand). 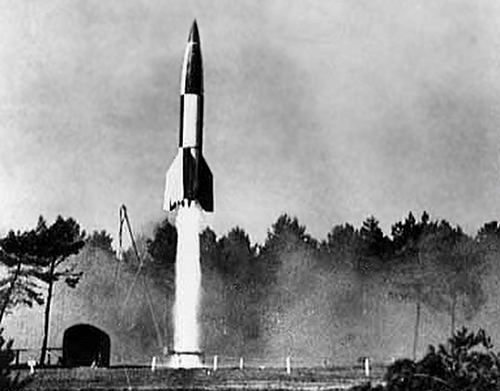 Germany: Wernher von Braun's team launches its first successful test of an A-4 rocket, which will become well known as the V-2 rocket that will terrorize London and Antwerp. The V-2 rocket was a long-range liquid-propellant ballistic missile, the progenitor of all modern rockets and the first known human artifact to enter outer space. Over 3,000 V-2 rockets were launched against Allied targets during the war, resulting in an estimated 7,250 civilian deaths, and 12,000 forced laborers were worked to death producing them, making it very difficult to reconcile Werhner von Braun's involvement in its development. Yet his post-war work for the US indicates that his passion had indeed always been scientific. NASA has referred to Wernher von Braun as "without doubt, the greatest rocket scientist in history." USA: US Secretary of Navy Frank Knox designates the new Marine Corps Training Area at Santa Margarita Ranch in California as Camp Joseph H Pendleton. USA - California: An American blimp covering the San Francisco Bay area misidentifies, bombs and damages the brand spanking new submarine USS GATO. Atlantic: Day 69 of 169 of Germany's Second "Happy Time," during which U-boats sink 609 Allied ships with little risk. ETO: Hitler orders a build up of defenses in coastal areas, later known as the Atlantic Wall. Russian Front - North: Day 197 of 872 of the Siege of Leningrad. Russian Front - North: Day 44 of 102 of the Battle of the Demyansk Pocket, another failed attempt to break the siege at Leningrad. The encircled German Army holds off yet another Soviet offensive. Russian Front - North: Day 60 of 103 of the Battle of the Kholm Pocket. Another attempt to break the siege at Leningrad. Russian Front - Center: Day 75 of 103 of the Battle of Vyazma, Russia. Russian Front - Center: Day 75 of 103 of the Battle of Sychevsk, Russia. Russian Front - Center: Day 21 of 49 of the Battle of Rzhev, Russia, a diversion to pull more German troops away from Moscow. Russian Front - South: Day 145 of 248 of the Siege of Sevastopol, Crimean Peninsula. MTO - Malta: A British convoy approaching Malta comes under an air attack which sinks one of their freighters and damages others. CBI - Burma: Day 100 of 164 of Japan's Invasion of Burma. Chinese troops repel the Japanese attacks, but come sundown they retreat toward Taungoo. CBI - China: Day 1,721 of 2,987 of the 2nd Sino-Japanese War. Day 90 of 99 of the 3rd Battle of Changsha. CBI - India: Japanese troops land on and capture the islands of Andaman and Nicobar in the Bay of Bengal. PTO - Borneo: Day 98 of 107 of the Battle of Borneo. PTO - Malaya: Day 33 of 357 of the Battle of Timor Island. PTO - New Guinea: Port Moresby is attacked again by Japanese aircraft. PTO - Philippines: Day 106 of 152 of the 1st Battle of the Philippines. 5th Air Force provides air support. ETO - Denmark: In a free election in occupied Denmark, the Government Party wins 143 seats while the Danish Nazi Party only wins 5. ETO - Germany: In its heaviest bombing raid to date, the RAF attacks Dortmund. Germany: Heinrich Himmler's statistician reports to him that, thus far, 633,300 Russian Jews have been resettled (more accurately, exterminated). A group of Greek Jews are deported to Auschwitz-Birkenau concentration camp. Russian Front - North: Day 562 of 872 of the Siege of Leningrad. Russian Front - North: Day 42 of 51 of the USSR's Operation POLAR STAR, a failed offensive north of Leningrad, hoping to take the southern shore of Lake Ladoga, Russia. Russian Front - North: Day 323 of 658 of the Siege of the Kholm Pocket, USSR lays siege to the Kholm Pocket but the Germans hold out for a about a year and a half. Russian Front - Center: Day 22 of 30 of the 3rd Battle of Rzhev-Sychevka, Russia. Soviet troops surround the German headquarters at Ternopil, Ukraine. MTO - Algeria: German Luftwaffe sinks the HMS WINDSOR CASTLE off the coast. MTO - Tunisia: Day 127 of 178 of the Battle of Tunisia. RAF and US Air Forces provide Allied air support. Day 8 of 12 of the UK's Operation PUGILIST. US troops emerge from Kasserine to meet the Axis. Day 1 of 16 of the Battle of El Guettar. CBI - Burma: Day 93 of 104 of the 1st Battle of Arakan. US 10th Air Force provides air support. The British stop their offense in Arakan Peninsula and begin falling back to the Maungdaw-Buthidaung line. CBI - Burma: Day 44 of 79 of the Allied Operation LONGCLOTH. CBI - China: Day 2,086 of 2,987 of the 2nd Sino-Japanese War. CBI - Indochina: US 14th Air Force hits targets in French Indochina. PTO - Alaska: Day 290 of 435 of the Battle of Kiska, Aleutian Islands. ETO - Germany: US 8th Air Force B-17s and B-24s bomb the airfields in western Germany and aircraft factories in the Brunswick area. ETO - France: US 9th Air Force B-26s at bomb Creil and airfields at Beaumont-le-Roger and Beauvais/Tille in the morning and in the afternoon they hit the Haine-Saint-Pierre marshalling yard. Russian Front - North: Day 51 of 191 of the Battle of the Narva Isthmus, Estonia. Both German and Soviet troops in the Baltic region remain in a defensive position. Russian Front - South: Day 91 of 113 of the USSR's Dnieper-Carpathian Offensive in southwestern Ukraine. Russian Front - South: Day 20 of 45 of the Battle of Chernovtsy, Ukraine. Russian Front - South: Day 18 of 44 of the Battle of Snigirevka, Ukraine. 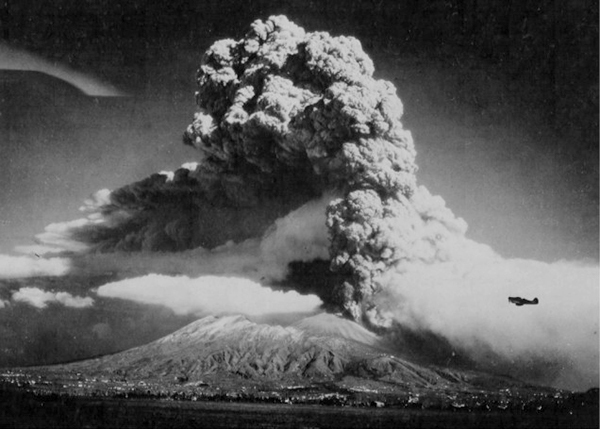 MTO - Italy: Day 6 of 6 of the eruption of Mount Vesuvius. The eruption has slowly abated. The raining of cinders and ash in the region is slowing. The black plume from the volcano changes from intense black to white. Bulldozers are busy plowing cinders to the side of the road in huge banks. It was slightly less than 1,900 years after the 79 AD eruption of Mount Vesuvius destroyed the Roman cities of Pompeii and Herculaneum. 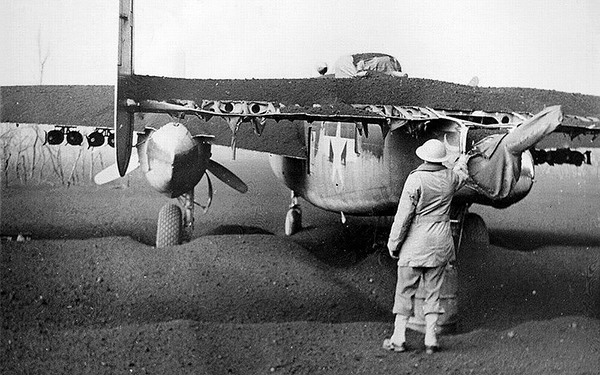 For soldiers on both sides and locals themselves, the eruption of Mount Vesuvius was a sight to behold. MTO - Italy: Day 67 of 123 of the Battle of Monte Cassino. RAF and US Air Forces provides air support for the Allied ground troops. A planned Allied assault on Monte Cassino is canceled. MTO - Italy: Day 62 of 136 of the Battle of Anzio. RAF and US Air Forces provides air support for the Allied ground troops. CBI - Burma: Day 85 of 99 of the 2nd Battle of Arakan. CBI - Burma: Day 19 of 166 of the UK's Operation THURSDAY. CBI - Burma: Day 14 of 147 of the Battle of Myitkyina. US 10th Air Force provides air support. CBI - China: Day 2,452 of 2,987 of the 2nd Sino-Japanese War. CBI - India: Day 16 of 118 of the Battle of Imphal-Kohima. Day 4 of 7 of the Battle of Sangshak. Japanese troops assault the Allied defensive position inside the crater of an extinct volcano. Supplies dropped for the Indian troops fall behind the Japanese lines. The Indians attack to retrieve the supplies, forcing the Japanese back. CBI - Indochina: US 14th Air Force attacks targets in French Indochina. PTO: US 7th Air Force attacks targets on Wake Island and in the Marshalls. PTO - New Guinea: Day 24 of 80 of the Battle of the Admiralty Islands. 5th Air Force provides air support. PTO - New Guinea: Day 187 of 219 of the Battle of Shaggy Ridge. 5th Air Force provides air support. PTO - New Guinea: Day 100 of 597 of the Battle of New Britain. US 13th Air Force provides air support. PTO - Palau Islands: Submarine USS TUNNY makes radar contact with Japanese sub I-42 off Angaur Island and sinks it. PTO - Solomon Islands: Day 144 of 295 of the Battle of the Bougainville Islands. US 13th Air Force provides air support. ETO - France: Day 236 of 284 of the Battle of Brittany. ETO - France: Day 190 of 236 of the Siege of Dunkirk. ETO: Day 64 of 66 of the Battle to the Rhine. Day 18 of 20 of the Battle of Ramagen. US 3rd Army makes another crossing near Worms. US 9th Air Force provides air support. ETO - Germany: Day 17 of 46 of the Battle of the Ruhr Pocket. British 2nd Army and Canadian 1st Army cross the Rhine River north of the Ruhr River. US 1st Army advances toward Siegburg. ETO - Germany: Day 32 of 36 consecutive RAF night raids on Berlin. The RAF also makes a devastating night raid on Hildesheim near Hannover, a small city of little military or industrial importance. Germany: Millions of Germans are ordered to migrate from western and eastern Germany to the center. Since no food and transports were allocated, this move becomes a disaster. Russian Front - Finland: Day 190 of 223 of the Lapland War. Finland and Russia have joined forces to kick the Germans out of Finland's most northern province. Russian Front - Center: Day 160 of 206 of the Battle of the Courland Pocket in Latvia. Russian Front - Center: Day 58 of 75 of the Battle of Königsberg, East Prussia (now Kaliningrad, Russia). Russian Front - Center: Day 57 of 63 of the Battle of the Heiligenbeil Pocket in East Prussia. Russian Front - Center: Day 42 of 54 of the Battle of East Pomerania, Germany. Soviets reach the outskirts of Danzig and Gotenhafen. Russian Front - Center: Day 39 of 83 of the German Siege of Breslau (today Wroclaw, Poland). Russian Front - Center: Day 9 of 17 of the USSR's Upper Silesian Offensive in Germany (today Poland). Russian Front - South: Day 11 of 34 of the Battle of Vienna, Austria. MTO: US 15th Air Force bombs targets in Germany, Austria and Czechoslovakia. CBI: USS SEA ROBIN rescues a downed American airman in the South China Sea. CBI - Burma: Day 48 of 99 of the Battle of Pakokku and Irrawaddy River operations in central Burma. The US 10th Air Force provides air support. CBI - China: Day 2,817 of 2,987 of the 2nd Sino-Japanese War. CBI - Indochina: General de Gaulle grants a limited self-government for Indochina, which is to remain a French colony. PTO - Japan: US 7th Air Force attacks three islands in the Bonin Islands. PTO - Japan: Day 33 of 36 of the Battle of Iwo Jima. US 7th Air Force provides air support. PTO - Japan: The USS YORKTOWN begins softening-up strikes against the Japanese island of Okinawa in preparation for the 01 Apr 45 invasion that will start the 83-day Battle of Okinawa. PTO - New Guinea: Day 452 of 597 of the Battle of New Britain. US 10th Air Force provides air support. PTO - New Guinea: Day 336 of 481 of the Battle of Western New Guinea. US 10th Air Force provides air support. PTO - Philippines: Day 155 of 299 of the 2nd Battle of the Philippines, aka the Liberation of the Philippines or the Philippines Campaign. PTO - Philippines: Day 99 of 244 of the Battle of Luzon. 5th Air Force provides air support. PTO - Philippines: Day 14 of 159 of the Battle of Mindanao Island. 5th Air Force provides air support. PTO - Philippines: Day 6 of 135 of the Battle of the Visayas region. 5th Air Force provides air support. Israel: Israel signs an armistice with Lebanon to de-escalate the 1948 Arab-Israeli War, also known as the Israeli Independence War.